This document is meant for developers who wish to install authentication via phone on their site. For integration, you must first have an account at teddyid.com. If you don’t, please log in once and it will be created. In all communications with Teddy your server must identify itself by its node ID (node_id). Each site or set of sites must have its own node_id. To create a node, log in to your personal account on teddyid.com, go to "Nodes" and create a "desktop application". Mutual authentication of nodes (Teddy server is ​​also one of the nodes) is performed using callbacks, as described in a separate document. If your site is written in PHP, it is recommended to use our library, which already implements all the methods you may need when communicating with Teddy while performing user authentication. When you create a "desktop application" provide the same secret key, which you have set on your server. In onAuth() you usually want to send the data to your server by submitting a form, redirect, or ajax request. If you want to customize the widget's appearance start from file https://www.teddyid.com/js/auth.js, change its styles and layout, save the new js on your server and specify the path to it in the line async_js.src = "https://www.teddyid.com/js/auth.js". Please keep in mind that the widget can change its height in a wide range (eg, new users will see first QR-code, and known users see a short form to select the account under which they are going to log in), it is recommended to display it over your site as a popup. Also, in order to increase awareness of the widget to users who can meet it at different sites, it is recommended not to deviate too much from the default appearance. For compatibility with older browsers please place on your server the file easyxdm_name.html, its content is identical to https://www.teddyid.com/easyxdm_name.html, and link to this file in the code of the widget, as in the example above. where to_node_id=1 is ID of node the request is sent to. The server's response is a JSON object. The values ​​depend on the result of processing. authenticated Authentication result: 1 if successful, 0 otherwise. login User’s login in Teddyid.com. The field is present only when authenticated = 1.
authentication_error Description reasons for authentication failure. The field is present only when authenticated = 0.
remote_id User ID in your system (if Teddy knows it). The field may be present only if authenticated = 1. If you received authenticated = 1 in the response, that means that the user was actually authenticated to your site with the token. Having received this response, you will probably want to open authenticated session for the user and redirect him to a page on your site or provide some content. As a result of user verification above, you receive user’s ID in Teddy. You can continue identifying the user with his ID in Teddy within your own system (this ID never changes for the same user). It is recommended to do just that if at the time of installation of the widget you do not have any legacy user base and Teddy is the only way of authentication. In any other case, you probably want to manage your own user base with your own IDs of users. In this case, you have to convert the user’s ID in Teddy received in response to user verification request, to user ID in your system. To do this you can for example store the correspondence of the user ID in Teddy to his ID in your system in a table in your database. However, Teddy can make this work for you and when you verify user ID, Teddy will also return user’s ID in your system - remote_id in the previous section. (The same parameters as for user verification, + remote_id). It is user’s first login to your site through Teddy, it can be detected by the lack of remote_id field in the response. In this case, you generate a new user ID in your system and immediately call the linking service. 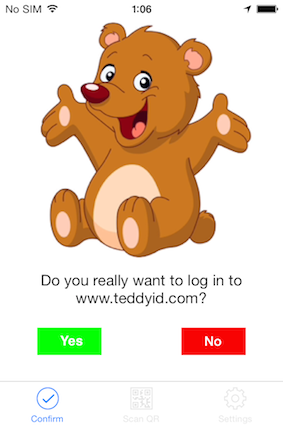 You want to enable existing users to log in to your site through Teddy in the future. To do this, after you authenticate the user via login and password or other authentication mechanism that you already use on your website, you offer the user to log in through Teddy too. After successful authentication through Teddy you know the user ID in your system and in Teddy and can link them. Teddy can be used not just for authentication (login) but for authorization of actions too. 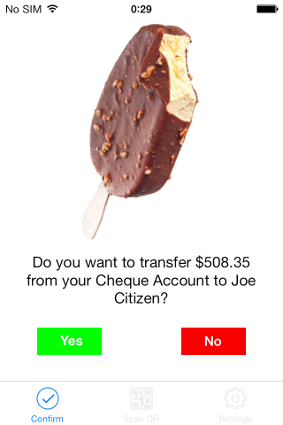 For example, if the user performs actions on your site that are sensitive in terms of security (money transfer, editing important data, other actions with serious consequences), you can prompt the user for additional confirmation of an action by sending the corresponding request to his phone. question The question you want to ask the user. It will passed to the phone verbatim. Max 300 characters. Teddy Server responds to your request immediately, without waiting for a response from the user. The server's response is a JSON object. Its contents ​​depend on the result of processing. request_id is an identifier assigned by the request, you can use it later to query the status of the request or it will be passed in Teddy request to your callback_url. auth_picture is URL of the picture you should display to the user. The same picture is sent to the user’s phone and the user needs to compare the pictures and tap “Yes” only if they match. This parameter may be missing if user’s app is not able to display pictures. recoverable - recoverable error: you can repeat the same query later, and it can be completed successfully. FOREIGN_USER The specified user never authenticated to any of your nodes during the last month. node_id Teddy node ID, always 1.
where to_node_id is ID of your node to which the request is being sent, secret_key is Teddy secret key. Any other response is regarded as an error processing the callback. The call occurs only once immediately after the user's response. If you are not able to process the request and give the correct response within 30 seconds, the request will not be repeated. If the user did not give any response on his phone (yes or no), then callback_url will never be called for this request. You can also periodically poll Teddy while waiting for user’s response to authorization request. response_date - the date of the response, or null if no response. You should poll the status of the authorization request until you get a response other than null, afterwards the status will not change. Similar to requests for authorization of actions, you can ask users for permission to get their contact information stored in Teddy. The user will be prompted on his phone, and if he answers "Yes", his contact details will be passed to your server. The scheme of work is exactly the same as when you authorize actions, the difference is only in data transmitted during queries. Below we indicate the only differences. domain Domain of your site that wants to get contact details of the user. The user should at least once in the past be authenticated to your website via Teddy. phone – user’s mobile phone. UNKNOWN_DOMAIN Specified user never authenticated to this domain during the last month.